Jay Bruce was mobbed on the field after driving in the winning run in the 10th inning of the Cleveland Indians’ 3-2 victory over the Kansas City Royals on Thursday. In their bid for sole possession of baseball’s longest winning streak in the last 101 years, the Cleveland Indians found themselves a strike away from losing on Thursday. 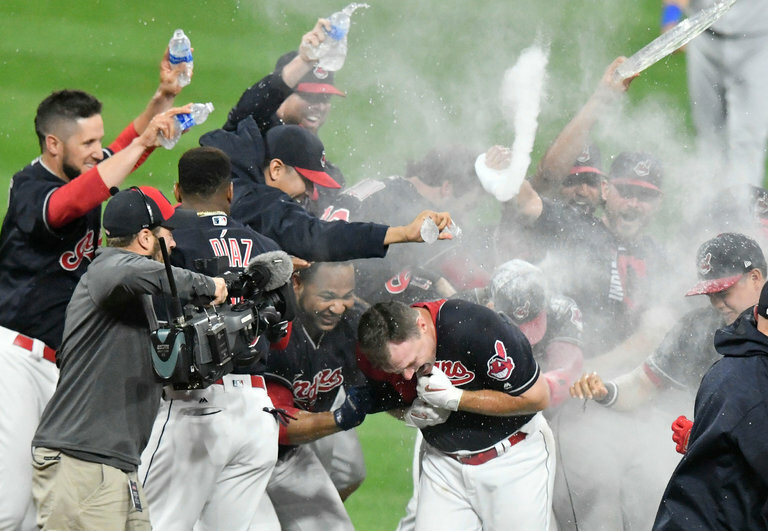 They trailed the Kansas City Royals by 2-1 in the ninth inning, but a familiar cast of characters pulled Cleveland back from defeat: Francisco Lindor tied the score in the ninth with a run-scoring double, Jose Ramirez led off the 10th with a double, and Jay Bruce drove him home for the remarkable win. The hallmark of the Indians’ streak had been almost total dominance, which made their desperate rally in Thursday’s game seem all the more impressive. In the first 21 games of the streak, the Indians had trailed their opponents for a grand total of four innings, but with Lindor at the plate in the ninth inning, they were down to their final strike before rallying.